Everyone’s had a bad night or two. We’re all familiar with tossing and turning, struggling to get some shuteye, and agonizing over the thought of not getting enough sleep and rest for the day ahead. For most people, this is an occasional problem that comes up before stressful and often important events—like entrance exams or work presentations. Others experience this right before or after a particular eventful day; imagine a child excited to go to Disneyland, or a teenager home after an amazing first date with someone they really like. It is a fact of life: Sometimes our brains keep us up and wide awake because of stress and worry, and poor sleep becomes unavoidable. 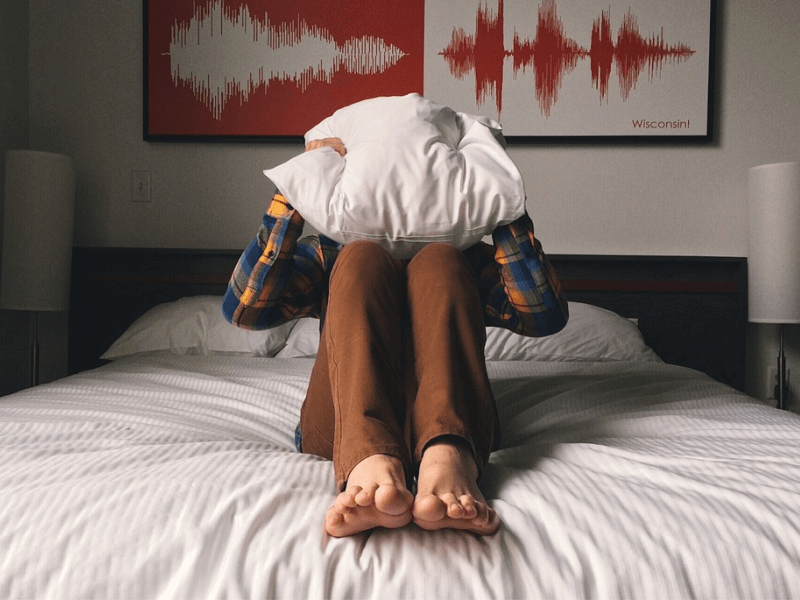 How Does Anxiety Affect Sleep? For some people, though, the tossing and turning happens every night. When negative thoughts, intermittent stress and random worries turn into regular occurrences—when they consistently disrupt your ability to fall asleep—it might be time to re-evaluate both your sleep health and mental health. It can be hard to tell whether your anxiety is getting worse because you can’t sleep, or you can’t sleep because you’re too anxious. The link between the two has been studied extensively, and while the relationship is complex and difficult to understand, what’s generally believed is that when one worsens, the other follows suit. In other words: If your sleep is disrupted often, you are at a higher risk of developing mental health issues—particularly anxiety disorders. And if you already suffer from severe anxiety, chances are you aren’t getting enough rest or sleep. What’s worse than tossing and turning? The clinical term for persistent trouble falling and staying asleep is chronic insomnia. With anxiety mixed in, usual symptoms and sleep interrupters associated with insomnia—muscle tension, racing thoughts, restless leg syndrome, teeth grinding, and more—can intensify. Other sleep problems can also develop. Lack of sleep also leads to other physical and emotional health risks: poor focus and performance, high blood pressure, diabetes, obesity, and more. When stress and worry start to take over your life and interfere with something as essential as proper sleep, you may have to face the fact that you are dealing with an anxiety disorder. This is a medical condition that should be taken seriously; as debilitating as diabetes or a heart condition, if not treated correctly. Anxiety disorders are prevalent and pervasive, and it’s more common than most people realize. According to the Anxiety and Depression Association of America (ADAA), over 18% of the US population are affected by anxiety disorders each year. Psychiatric disorders of this kind are characterized by uncontrolled stress and extreme worry or fear—usually unwarranted. Obsessive-compulsive disorder (OCD), agoraphobia and other specific or situational phobias, generalized anxiety disorder (GAD), panic attacks and panic disorder, social anxiety disorder, and post traumatic stress disorder (PTSD) all fall under the umbrella term of anxiety disorder. There is even a condition called sleep dread, which is an anxiety disorder that manifests as a fear of sleeping. The bottom line is that poor sleep is bad for your peace of mind, and anxiety is bad for your overall health. If you suspect that you suffer from excessive anxiety, or if you have chronic insomnia and you can’t pinpoint why, please do consider going to a mental health professional or a sleep clinic. If this seems too large a step to take, even visiting your personal physician will do. Discuss your troubles and symptoms with a qualified doctor; the sooner you do, the sooner you can start looking into treatment options—like cognitive-behavior therapy, sleep medicine or dietary supplements, or a combination of both—that will lead to a better night’s sleep in the future. It is important to try and deal with the problem as soon as you are aware of the issue. If you’re still at a stage where your anxiety is manageable but slowly ramping up—either in frequency or scope—you can develop healthier habits and routines before it gets worse. Below are some steps you can take to reduce mental and emotional stress and anxiety. You can also check out our general tips to improve your mindset for better sleep. Yes, we know it’s not easy to do—and that fact is likely adding to the stress of it all. However, it is important to dissect your thoughts and feelings to identify the root of the problem. Start with general questions and narrow it down until you find something that you can work on concretely. For example: Are you stressed about not getting enough sleep, or are you unable to sleep because you’re stressing about other things like work or school? If it’s the former, you should work on your improving your sleep hygiene and sleep environment. If it’s the latter, you should focus on those other stressors earlier—before it’s time to go to bed. This brings is to the next step. Are you worrying about events that have already come to pass, or situations you have no real control over? You can’t do anything about it while you’re lying in bed in the middle of the night. Address the intangible things brewing in your mind by giving them a physical form that you can affect: Write down what’s bothering you on a piece of paper, then throw it away or set it aside. What you do with the piece of paper is symbolic of how you want to deal with what’s written on it. Alternatively, if you’re worried about tasks that you need to complete the next day, list them all down and allow yourself to stop thinking about them—they’re already written down anyway. Even if you forget, you have a list to help you remember everything. When the next day comes, actually take out the list and prioritize crossing out what’s on it. Accomplish what’s important, delegate what can be delegated, and identify what you didn’t really have to worry about in the first place. This will help manage your stress levels by training you to take on only what’s possible for you to do. Regular exercise is always a good idea, and is generally regarded as beneficial to both physical and mental health. It releases endorphins that have a positive effect on your mood, and it also provides a harmless way to release your negative emotions and frustrations. While low impact exercises like walking and yoga are already helpful; an increase in intensity and the resulting physical tiredness can potentially be better. The idea is that the more exhausted you are, the faster and more soundly you will fall asleep. Exercising your mind regularly through meditation is also important, especially if you already have trouble quieting your mind during bedtime. Breathing exercises, visualization techniques, or even just sitting in silence for a set amount of time each day—as long as you stick to it. The key is consistency, because the more you practice meditation in planned intervals, the easier it will be for you to apply the same techniques when your mind keeps you up at night. Contrary to popular belief, you shouldn’t stay in bed if you’re not sleepy. It hurts more than it helps. Not only does doing this teach your body and mind that you can stay awake in bed, but it also doesn’t replace the rest you would have gotten had you drifted off bedtime. If you don’t fall asleep within 20 or 30 minutes of lying down, get up and out of your bedroom. Stay in an area indoors that is dark or dimly lit. Some things you can do to encourage sleepiness: listening to calming music, reading a boring book—textbooks are better than fiction, as following a story will keep your brain active and awake—or drinking a calming tea or infusion. Whatever you do, don’t turn to your smartphone, tablet, laptop or television. Doing the latter will just make it harder for you to fall asleep. If there’s one thing that people get wrong about bedtime, it is that there needs to be a period of time before it that is dedicated to winding down. You shouldn’t go to bed straight from doing something else—chores, errands, even something as simple as writing emails—and expect to fall asleep within half an hour. Even when you’re exhausted from exercise, you still need to do warm-down stretches for recovery. When you wind down—by taking a bath, sitting quietly and reading a book or listening to a podcast, or even meditating—you prepare your body and mind for sleep. Think of it as tidying up before leaving the office, or turning off the lights before leaving a room. If you find after winding down consistently for a few nights that it’s not working, consider changing your bedtime. You may be going to sleep when your mind and body are still very much active, and your bedtime may simply be incompatible with your waking schedule. Sometimes a small change—maybe an hour or two—can do wonders.